A new Thames 307E van is sold at Board's Garage in 1964. Homepage. This page: A customer is invoiced for the purchase of a new Ford van in Devon during the 1960s. 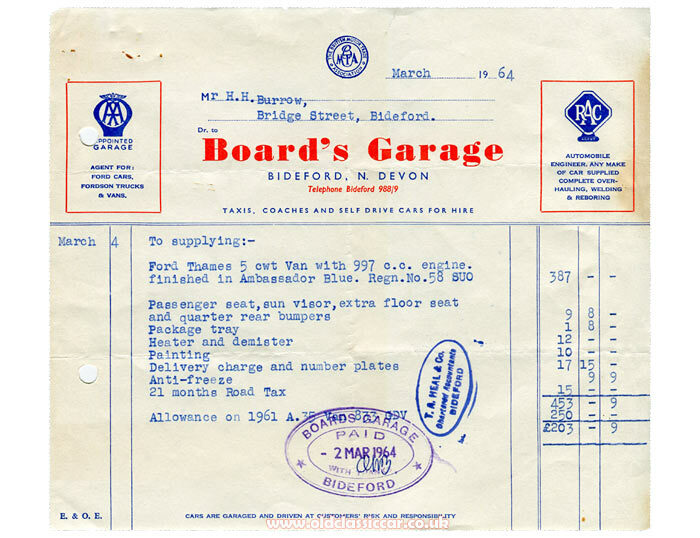 Board's Garage for Ford & Fordson vehicles. Board's Garage in Bideford, Devon, was the local Ford and Fordson vehicle distributor for a Mr H.H. Burrow, of Bridge Street, who - in March 1964 - signed on the dotted line for a brand new Ford Thames 5cwt van, registration 58 SUO. The new van, model code 307E and based on the 105E Anglia saloon, was painted Ambassador Blue and came with a number of extra-cost options. A 1961 Austin A35 van was being part-exchanged against it (registered 833 GDV). Neither vehicle is listed as still registered with DVLA, so presumably both met their end in the jaws of a scrapyard's crusher. The extras ordered by Mr. Burrow are listed as follows: passenger seat, sun visor, extra floor seat (? ), rear quarter bumpers, package tray, heater/demister, painting, anti-freeze, 21 months of road tax, number plates, plus a delivery charge. This brings the total price to just over 453 GBP, from which 250 GBP is deducted in allowance for the A35. Specific details regarding the AA and RAC approved garage's address are not given. A search online for a Mr Burrow of Bridge Street brings up reference, in 1928, to a garage in the names of H. & H.H. Burrow, with addresses in both New Road and Bridge Street, so perhaps the Thames van was being bought from Board's for use by another motor engineer in the area. After the war Mr Burrows was a radio engineer, so more likely the Thames was bought for this business. An invoice from 1949 from the same source, records Mr Burrows (plural this time...!?) buying Pool petrol from Warmington's Garage in Bideford. The 5cwt Thames of this era was based largely on the contemporary Anglia saloon. A restored example of the 307E can be found on this page of the site, while a photo taken in the 1960s of a similar vehicle may be found here. Return to the Motoring Collectables section for more classic garage-related items like this.